One-way ticket out of Tokyo-to. Powerful iOS and Android devices give us the privilege of enjoying console games on the go, even classics from Sega's Dreamcast. It's important to remember, though, that just because a publisher can port these beloved titles to smartphones and tablets does not mean it should. 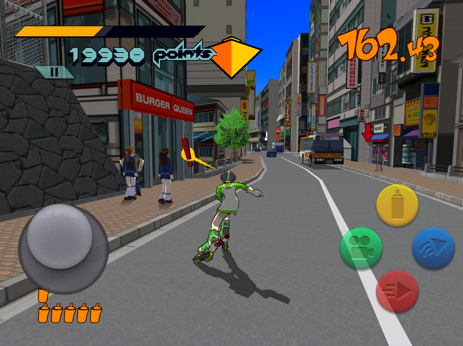 At the moment, we can't think of a game that proves this point better than Jet Set Radio. 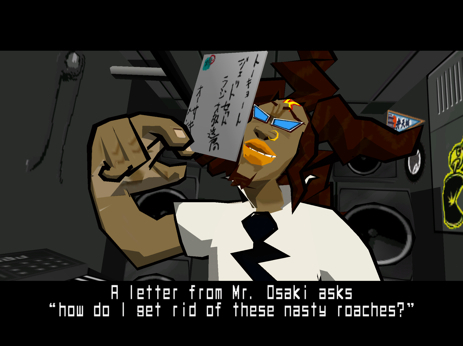 Originally released in 2000 for the company's ill-fated system, the stylish graffiti-driven romp kick started the cell-shading phase, while its (at the time) outstanding soundtrack delighted players from the U.S. to Japan. Now it's gone mobile, and we really wish it hadn't. Why? Terrible controls. To be fair, the original Dreamcast version came with a slight learning curve that involved navigating the attractive cartoon world on roller blades while manipulating the camera to avoid traffic and pesky police officers. Now adapt that to a virtual analog stick and buttons, and those issues magnify at least 50 times. Steering Beat and his gang of rebellious youths is, quite frankly, a chore. Need to go in a straight line? OK, fine. Need to grind along a rail, jump over a barrier to collect spray cans, stick the landing and then leap onto a higher platform? Borderline impossible on one go. 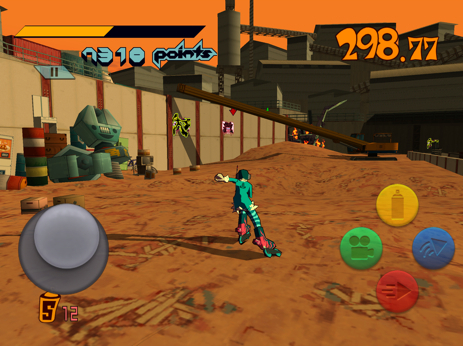 The controls simply fail to give players full command of the action. An excessive amount of trial and error ensues, where you may need upwards of 10 attempts to perform the simplest action. Now throw in constant wrestling with the camera to avoid getting hit by vehicles and gang tackled by cops, then add a set time to complete each mission, and you have a recipe for frustration. In regards to aesthetics, it's a faithful port of the original, translated into English. The cell-shaded graphics, despite being 12 years old, look impressive on the iPhone 5 and iPad third generation and higher Retina displays, despite noticeable pop-up as people and objects suddenly spring into view, even at short distances. Not exactly cutting edge, but it's nice to know Sega handled things with care. The same goes for the soundtrack, which is mostly intact and as catchy as ever. Between DJ Professor K's booming rants and the foot-tapping beats, Jet Set easily trounces most iOS and Android games on the market. A pair of quality headphones makes all the difference. As for playing the game, you'll run through a series of missions where the primary goal is to spray paint assigned targets by collecting cans, then tapping the paint button to automatically tag something (the hood of a car, perhaps), or create more elaborate paintings by executing a series of touch screen commands that respond decently enough. Ultimately, though, it all comes back to those dreadful controls. We love Jet Set Radio. The game made a lasting impression all those years ago, and a sequel (on consoles, please) would definitely receive our full attention. This, however, is something we'd care to forget, and quite frankly, wish never existed. Unless Sega can somehow patch that arcade stick through an update, the iOS and Android port will tarnish what is otherwise a short but sweet franchise. Leave this one alone. Review code provided by Sega. What's Hot: Cell-shaded graphics and catchy music perfectly translated to smartphones and tablets, variety of characters to recruit. What's Not: Loathsome controls ruin the experience, camera troubles.